Many of the links in this old article are now missing, and I have not been able to find the original sources. But most of the information is still here, and I trust that my warnings will be helpful. Variations in spelling: Kabala, Cabala, Cabbalah, Qabala, etc. Kabbalah -- which can be spelled with a K, C or Q -- is an ancient form of Jewish mysticism, which was formalized at the end of the 12th Century. Having turned Biblical truth and history into occult myths and suggestions, it has evolved through the centuries -- blending with gnosticism, theosophy and other occult mysteries -- usually behind closed doors and in secret societies. But these hidden mysteries are now communicated openly through the Internet, popular books and celebrities such as Madonna. Highlighted at Gorbachev's 1997 State of the World Forum, it has drawn followers among the world's elite as well as the stars of Hollywood. We offer you this information, not to build interest in occult arts, but to alert Christians to a deception likely to be promoted in today's thrill-seeking, open-minded, pluralistic atmosphere. "Most forms of Kabbalah teach that every letter, word, number, and accent of scripture contains a hidden sense.... Since the late 19th century, with the emergence of the 'Jewish Studies' approach, the Kabbalah has also been studied as a highly rational system of understanding the world, rather than a mystical one." 2. The New Kabbalah: "The New Kabbalah is a philosophy and Jewish theology grounded in the union between traditional Jewish mysticism and modern rational thought. ...the New Kabbalah seeks to uncover and further develop the philosophical and psychological significance of Kabbalistic symbols and ideas. In addition, the New Kabbalah is enriched by comparative studies and dialog between Jewish mysticism and other religious and philosophical traditions, including Hinduism, Buddhism, Platonism, and Gnosticism. "The New Kabbalah is born out of the conviction that the theosophical system of Luria and his followers promotes an open economy of thought, dialog and criticism while at the same time providing a coherent and comprehensive account of the world and humanity's role within it that is intellectually, morally and spiritually vital for us today." "'Linear, mechanistic' ways of 'rational thought' need to be set aside in order to fully grasp Kabbalah teachings. Yehuda Berg states that Kabbalah is the 'hidden wisdom' that has been kept secret for centuries but now this teaching is coming into the open for a society fraught with social and spiritual problems." Kabbalah - Page 2: "In Kabbalah, the Creator is Ein Sof, which literally means 'endless.' ... Ein Sof pervades all creation, so that even a stone has divinity; In Kabbalah, The Shekinah is sometimes called Eden, and the Torah is the Garden where God hid the light. By becoming vessels of light, we can regain Eden. "Various accounts of creation are given One is that Ein Sof emanated a spark, 'from which emerged and radiated all light' and this constituted the upper world. A lower world was created from a light 'without brightness,' which represents a lower consciousness." "Kabbalah... is not about worship or belief, but rather 'becomes a direct path of communion between the individual and the Divine.' The Tree of Life and the sefirot have been used in New Age and occult teachings, and aligned with occult tools such as the Tarot. Indeed, the Kabbalah has been a basis for Western occult teaching for several centuries, though it should be noted that many Kabbalists and traditional Kabbalist rabbis do not sanction such activity. KABBALAH - Page 4: "In Kabbalah, Adam and Eve are viewed as symbols of male and female energy [as in Tibetan or Tantric Buddhism], and as metaphor for the 'primordial Vessel whose existence' came before creation, thus encompassing all the souls of humanity to come. The presence of the Serpent, considered a fragmenting force, was necessary for creation; otherwise, all would unite with God. This gave man the opportunity of earning the Light on his own. "One of the hidden meanings of the story is that there are two Gardens of Eden, one above, and one below, and reuniting these two Gardens is the goal of humankind. "Yehuda Berg believes that the forbidden fruit was a sexual act between Eve and the Serpent. Another writer interprets the sin as Adam driving out the Shekhinah by eating only from the Tree of Knowledge of Good and Evil, and not from the Tree of Life, thus separating Shekhinah from her 'husband,' Tiferet, and separating consciousness from unconsciousness. This act caused Adam and Eve to lose their garments of light and fall into a lower physical form, becoming clothed with garments of animal skin.... Adam and Eve chose with good intentions to have more Light, since this is what the Serpent offered. This choice was wrong, but because the Serpent’s temptation enhanced the difficulty of their choice, it was also worthy. "Yehuda Berg also teaches the Certainty Principle. [i.e. positive thinking, not certainty concering fact or truth] Using the story of the exodus as an example, he explains that God did not part the Red Sea; instead, Moses and the people proceeded with certainty and this gave them the power to part the waters. ....We 'print our own ticket' to Paradise through our individual work. Michael Berg advises one to rediscover who we truly are, to realize we must share in order to take on the Creator’s essence. By doing this, we will bring about the world’s transformation, and can even bring about the end of pain, suffering, and death itself...."
"The Kabbalah is essentially gnostic; that is, one must learn the spiritual secrets of the Torah through the cryptic and intricate Zohar, and then advance through knowledge and actions. This is in strong contrast to Biblical, orthodox Christianity, which is essentially relational and is based on a clear, direct revelation from a personal God and on the historical death and resurrection of God’s Son, Jesus Christ. We do not need to delve into esoteric realms to find the truth; truth is readily found in God’s word, and was declared by the Messiah, Jesus Christ (John 14.6). "Nor do we earn redemption by works, but rather redemption is offered through the atonement of Christ..... Phillip Berg writes that we must have the desire to 'receive in order to share' so that the Vessel will be able to receive the Creator’s Light 'in full force.'... Our actions in the physical world create 'channels that connect us to the Divine.'... There seem to be some parallels between this teaching and the emphasis in Gnosticism on the remote, unknowable divine being and on the Light." According to "The KABBALAH and the Tree of Life," a chapter in the book pictured here, the "Kabbalah may be defined as esoteric Jewish doctrine. The word Kabbalah comes from the Hebrew root QBL, meaning 'to receive,' and refers to the passing down of secret knowledge through an oral transmission." "The original Gnosticism is still discernible in the figure of Metatron, which plays a considerable part in the Hebrew Book of Enoch and subsequent Cabala. As the highest angel he occupied a seat next to the throne of God. The Babylonian Talmud contains three references to Metatron." "TREE OF THE COSMOS... This book cover symbolizes the beliefs of Jacob Boehme [sometimes spelled Böhme or Behmen]. The upper portion depicts the Kabalistic unity of deity. The hexagram in the top circle [often called the Star of David] is actually two intertwined triangles. Shown separately side-by-side below the hexagram, those two opposite triangles are labeled 'Nature' and the 'Eternal.'" "The larger sphere at the bottom is called the "Solar World." Surrounding the sun in the center are the signs of the zodiac. As in alchemy and other occult systems through the ages, the Kabbalah includes astrology. "Under the influence of the Splendours, the shining light spreads to create the second sefira [Wisdom].... It contains the general plan of the construction of the world, which is manifested concretely in the third sefira [Intelligence].... The theoretical problem of the Cabala is how to preserve the unity of the Creator... .
"The Cabalist has to fight against the darkness of the world and his quest is to try to illuminate it. The intense passion which guides him shows that love and knowledge are often synonyms." "...at the end of the fifteenth century... the center of Kabbalism shifted to Palestine. A mythology and theosophy developed, as complex as those of early Christian Gnostics, which they closely resemble. The sefirot became rearranged in new configurations, male and female...."
Symbols of the Kabbalah: "Dr. Sanford Drob articulates the philosophical and psychological ideas that are implicit in such kabbalistic symbols as Ein-sof (the Infinite), Tzimtzum (Divine Contraction), Sefirot (Divine Archetypes), Shevirat ha-Kelim (Breaking of the Vessels), and Tikkun ha-Olam (the Restoration of the World). Dr. Drob shows how contemporary philosophy and psychology enable us to gain insight into the theosophical Kabbalah, and to understand the Kabbalah in a manner that is vitally relevant to contemporary life and thought. It is the author's conviction that the theosophical Kabbalah provides a symbolic matrix through which the 'ultimate questions' regarding God and the world, and the meaning of human existence, can be provided with satisfactory solutions. Rather than being an antiquated mystical and theosophical system, the Kabbalah provides us with a dynamic conception of God, world, and humanity that encompasses all happening and all things, and which enables us to understand even the daily activities of men and women as vital to the redemption of the world." ophy, Platonism, Gnosticism, and the works of Hegel, Freud, and Jung. ... Recognition of the parallels between the Kabbalah and modern philosophy and psychology provides us with valuable insight into both the Kabbalah and modern thought, and helps pave the way for a 'new Kabbalh,' one that is spiritually and intellectually relevant to contemporary life. "...the Kabbalah is unique in its position in the history of Western thought, acting as a 'switching station' in which the biblical tradition, Near Eastern mysticism, and Western philosophy converge. In the Kabbalah of Isaac Luria these traditions combine with Luria's profound spiritual insight and intense mythical imagination to produce a comprehensive philosophical and psychological vision of the nature of God and humanity..."
"The Qabalah is usually classed under four heads: (α) The practical Qabalah. (β) The literal Qabalah. (γ) The unwritten Qabalah. (δ) The dogmatic Qabalah. The practical Qabalah deals with talismanic and ceremonial magic, and does not come within the scope of this work." "The Unification of God and His Shekhina: The Zohar holds that God's feminine aspect is exiled on earth as the 'Shekhinah' and that she must be reunited with "The Holy One....' The unity between the masculine and feminine aspects of the godhead was broken by the sins of mankind, and the exile of the Jewish people, and is maintained by the 'Other Side'. Through the observance of the mitzvot and divine worship, humankind is able to reestablish the union between God and His Shekhina, symbolized as the union between the Sefirot Tiferet and Malchuth. "The Raising of the Sparks: The symbol of a divine spark encased in earthly matter is an ancient Gnostic symbol, which takes on new life in the Kabbalah of seventeenth century Safed. In the Gnostic version, a spark of divinity is entrapped in an alien and evil world, and imprisoned in the soul of man. According to the Gnostics, the individual's knowledge (Gnosis) of the spark within himself results in its being liberated from this world, and the Gnostic adherent abandons both body and self to join the infinite pleroma. ...In contradistinction to the Gnostics, Luria held that when the spark of divine light is freed, the world is reintegrated and restored, rather than escaped and discarded. According to the Hasidim it is the individual's divinely appointed task to not only liberate those sparks that are entrapped in Kelippot within his own body and soul, but also those sparks in the world that he or she encounters along life's way." "The Western world rejected the idea of reincarnation until acquaintance with Eastern philosophy during the 19th century reawakened thoughts about transmigration of the soul life after life. Many are the references to this, particularly in the older Kabbalah, for the majority of the older Kabbalists believed in gilgul, the Hebrew term for transmigration.... Using the Tree of Life, the Kabbalah built up a system of symbolic correspondences between the manifestations of divine powers, letters, numbers, and the different parts of the human body." Theosophy - An introductory study course: "Theosophy is old because it embodies principles that have been known and taught by the sages of the past all over the world. It has been called by many names. In India it is called Brahmavidya 'The Wisdom of Ultimate Reality' or Sanātana Dharma 'The Eternal Teaching.' In Judaism it is called Kabbalah - 'That Which Has Been Received.' In China it is called Tao Hsueh 'The Teaching of the Way.' In Islam it is called Sufism 'The Way of Those Who Wear Wool” (the 'pure' or the 'wise').... It has also been called the Wisdom Tradition, the Perennial Philosophy." Kabbalistic Metaphors: Jewish Mystical Themes in Ancient and Modern Thought: (scroll down to title) "Kabbalistic Metaphors... places the major symbols of the theosophical Kabbalah into a dialogue with several systems of ancient and modern thought, including Indian philosophy, Platonism, Gnosticism, and the works of Hegel, Freud, and Jung. ... Recognition of the parallels between the Kabbalah and modern philosophy and psychology provides us with valuable insight into both the Kabbalah and modern thought, and helps pave the way for a 'new Kabbalh,' one that is spiritually and intellectually relevant to contemporary life. Popular Occultism. Red Kabbalah Strings -- Hermetic Kabbalah: "The Western Esoteric (or Hermetic) Tradition, a precursor to both the neo-Pagan and New Age movements, is intertwined with aspects of Kabbalah. Within the Hermetic tradition, much of Kabbalah has been changed from its Jewish roots through syncretism, but core Kabbalistic beliefs are still recognizably present. 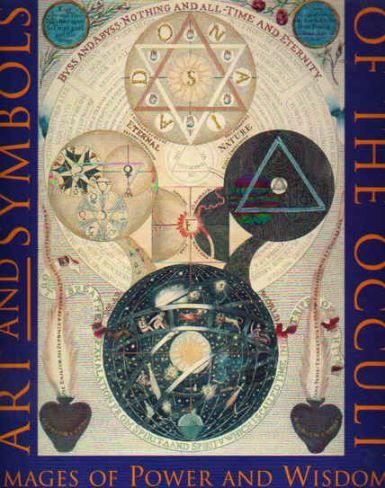 "'Hermetic'Kabbalah, as it is sometimes called, probably reached its peak in the Hermetic Order of the Golden Dawn, a 19th-century organization that was arguably the pinnacle of ceremonial magic (or, depending upon one's position, its ultimate descent into decadence). Within the Golden Dawn, Kabbalistic principles such as the ten Sephiroth were fused with Greek and Egyptian deities, the Enochian system of angelic magic of John Dee, and certain Eastern (particularly Hindu and Buddhist) concepts within the structure of a Masonic- or Rosicrucian-style esoteric order. 4. Andre Nataf, The Wordsworth Dictionary of the Occult" (UK: Wordsworth Editions Ltd., 1988), pages 20-24. From: An Encyclopedia of Religions (New York: The Philosophical Library, 1945), pages 412-413. Fergilius Ferm (editor). Kabbalah: (Heb. Kahn—to receive, hence tradition) The esoteric mystic lore of Judaism based upon an occult interpretation of the Bible and handed down as secret doctrine to the initiated. long development, many streams from alien sources flowed into it—Gnosticism, Neo-Platonism, Neo-Pythagoreanism, possibly also Zoroastrianism and Suffism**. work, and the “Shiur Komak” (The Measure of the Height) an anthropomorphic work on the dimensions of the Deity. to Germany, Judah the Pious and Eleazar of Worms, and, in Spain, Moses ben Nachman. 1620) who committed the teachings of Luria to writing. Luria was the founder of a school of Kabbalistic speculation in which redemption and messianism figured prominently which greatly influenced the subsequent development of Kabbalab. The Lurianic Kabbalah was one of the spiritual sources of the popular mystic movement of Eastern Europe in the 18th and 19th centuries known as Chasidism [Hasidism]. With the advent of the Zohar, the study of Kabbalah spread among the masses of the people. which fed many superstitions and aberrations. of finding substantiation for Christian doctrine -- in the mystic writings of the Jews. The central themes of Kabbalah are the nature of the Deity—the “En Sof”—(The Limitless One) and the ways by which He has made Himself manifest—the “Ten Sefirot” (Emanations), the four Universes of Atzjlah (Emanation), Beriah (Creation), Yetzirah (Formation), and Asia (Action) the Soul of man, its nature and consummation, the mysteries of the Divine Name, good and evil, man’s place in the universe, heaven and hell, the order of the angels and demons, Israel, the Exile, redemption and the Messiah. "Kabbalah employed a characteristic exegetical technique which gave it great freedom and scope. It regarded not only every word of the Bible—written in Hebrew, the very language of God—but every letter, every vowel and all their possible permutations and combinations as holding profound mysteries. Thus the Bible was interpreted not only literally, allegorically, homiletically and anagogically, but also through the devices of Gematria (the interpretation of a word according to the numerical value of its letters), Notarikon (taking each letter of a word as the initial of some other word), Temurah (substituting one letter for another) and Tziruf or Chiluf (transposing the letters—anagram). Thus Kabbalah never felt the constraint of the “letter which killeth” and never came into conflict with the written Scriptures as Christian mystic, frequently did. See Judaism (Introductory)."